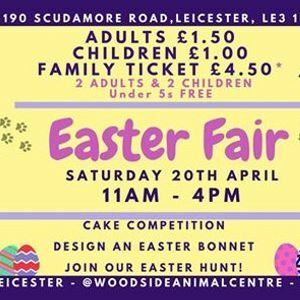 This year, Woodside is introducing our very first Easter Craft Fair! 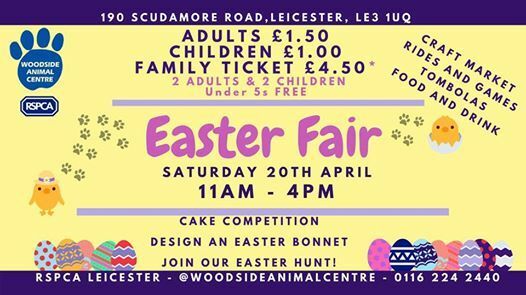 On Easter Saturday (20th April) we will be opening our gates and welcoming everybody to take part in our family-friendly event to help raise funds for the Woodside Animal Centre. There’ll be over 40 craft stalls from around Leicestershire, plenty of activities and lots to eat and drink! The generous people at Mattel, the manufacturers of the likes of Barbie, Hot Wheels, Fisher Price and Thomas the Tank Engine have donated lots of great prizes to be won! We’ll be running lots of fun fundraising stalls such as our Hook a Duck game, brand new Bucket Ball, our classic raffle and the ever-popular Pet Tombola. Our Easter Egg Hunt around the animal centre will have children learning about animal welfare and husbandry while having fun and earning some tasty chocolate. Make sure you sign up at our Egg Hunt Registration tent near reception! We’re also having a professional Zentangle workshop, an Easter Bonnet Contest and a Baking Competition – there really will be something for everyone! You can pay entry on the gate, or you can use our new fast-track online booking system to beat the queues on the day! Stallholders to email a2F0aWUgISBtdW5kZW4gfCBSU1BDQUxlaWNlc3RlciAhIG9yZyAhIHVr with details of their stalls and businesses to inquire about stall bookings.